Institutional arrangements within and between environment ministries and women’s affairs mechanisms are necessary to make progress toward realizing gender equality and equitable, sustainable environmental governance. 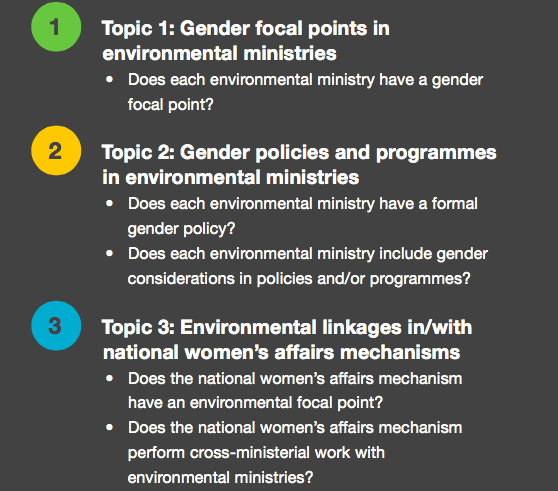 Survey responses illustrate how gender considerations are being integrated in environmental ministries. The agricultural sector stands out as the leader in every aspect of this dataset: ministries of agriculture are most likely to have gender focal points and gender policies and include gender considerations in programmes and policies. They are also the ministries most frequently conducting cross-ministerial work with women’s affairs mechanisms. Responses also show how women’s affairs mechanisms are involved with environmental issues.